In mid-December 2017, 380 athletes from 60 countries and regions took part in the 47th edition of the World Youth Sailing Championships in Sanya. With the waters around the island always above a comfortable 20 degrees Celsius, conditions were perfect for competitors at the world’s premier junior sailing event. Near the sailing venue stand several grand buildings, built to resemble sails. This is Sanya Phoenix Island International Cruise Terminal, the largest cruise terminal in Asia, which can accommodate the largest luxury cruise liners in the world. The terminal is always bustling after the introduction of new routes. On November 22, a Chinese cruise ship, carrying nearly 1,000 tourists on its maiden voyage, sailed from Sanya across the South China Sea to the Philippines. And from the port of Haikou, in the north of the tropical island, tourists can voyage to Vietnam and the Philippines. 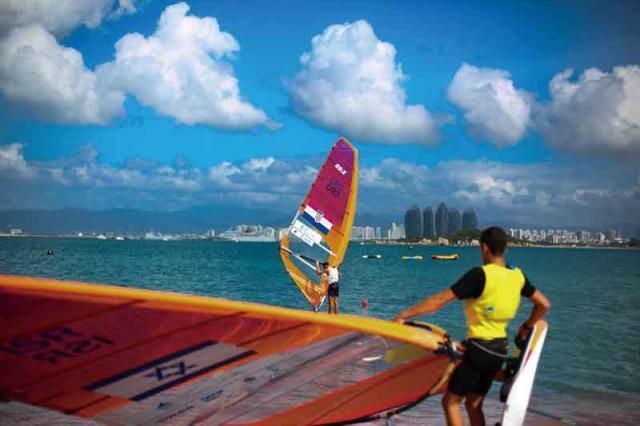 Hainan is at the forefront of the development of a pan-South China Sea regional tourism and economic cooperation zone. Relying on its natural resources similar to those in Hawaii and Miami, Hainan plans to turn Sanya into an “International Cruise Capital” on a par with Miami. The world’s top four cruise companies have chosen Sanya as port of call on their cruise itineraries. When a cruise liner docks at Sanya, aside from the tropical sunshine and beaches, visitors can choose trips to the rainforest, hot springs, or some of Hainan’s cultural destinations. 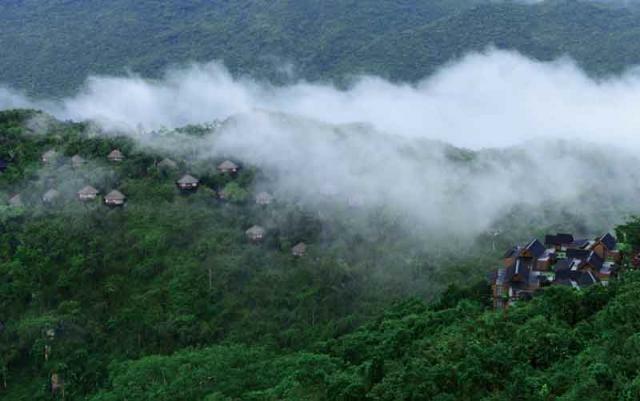 These include Nanshan, a Buddhist cultural tourism zone, and the Binglanggu Tourism Zone in Baoting County, where you can find the traditional culture of the Li and Miao ethnic minority groups. It is sure to be a completely different experience from Hawaii or Miami. 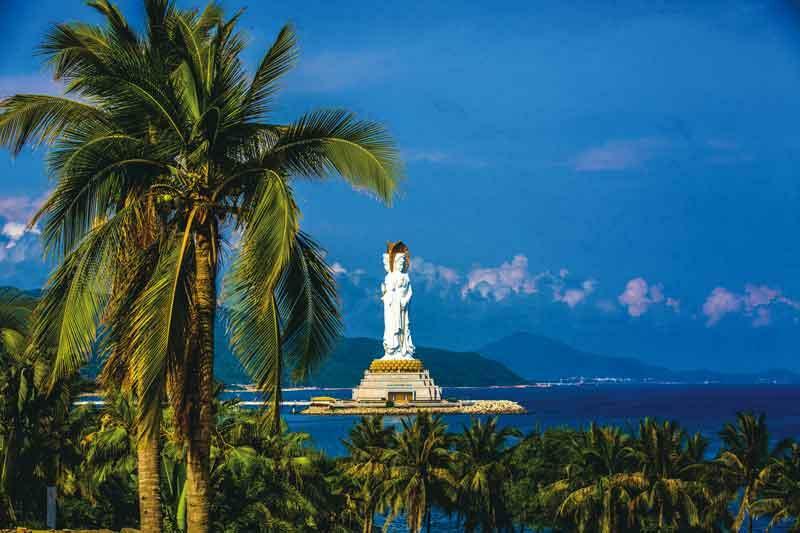 At Nanshan, an imposing 108-meter-high, three-faced Guanyin Buddha statue stands amid the azure waters of the South China Sea. The statue, the largest of its kind in the world, peacefully watches over the tens of thousands of people that flock there to pray every day. Binglanggu is a cultural park that displays the ethnic culture of the Li and Miao, two ethnic minority groups with a long history in Hainan. Their traditional boathouses, clothing, singing and dancing, spinning and embroidery skills and musical instruments are a fascinating window into their culture. Their songs and dances reveal the romantic traditions among local youth, a pure beauty that you can appreciate without understanding the words. Also on display are 10 intangible cultural heritage crafts, among which the “Traditional Spinning, Dying, Weaving and Embroidering Techniques of Li Ethnic Group” is on the UNESCO List of Intangible Cultural Heritage in Need of Urgent Safeguarding. In Binglanggu, traditional Li weavers use a simple tool to weave colorful Li Brocade. Each piece is one of a kind, as there is no pattern, and the expert craftspeople improvise every design. With only oral language and no written language, the Li ethnic group expresses their yearning for a better life through a variety of totems. It would be exciting to receive a precious piece of Li Brocade as a gift. That was what happened when more than 200 Russian tourists flew from Moscow to Sanya in November 2017. They were the first group of tourists to visit after Hainan Island passed the one million inbound tourist mark for 2017. “Flying from cold Moscow to warm Hainan, I was left with an indelible impression by the grand welcome,” said one Russian girl. Committed to developing an international tourist island, tourism leaders from Hainan have been busy promoting China’s jewel of the South China Sea, and they are striving to launch new flight routes every year. At present, Hainan has more than 50 international routes connecting to Hong Kong and other regional destinations in East Asia, Southeast Asia and Europe. In the next two years, it is expected there will be some 100 international flight routes. As one of the most convenient and open regions in China, Hainan has a “visa-free” policy for tourist groups from 26 countries, including major countries in Asia, Europe, North America and Oceania, and is also promoting the “visa-free” policy for citizens of another 59 countries. High-speed railways and convenient highways allow tourists to travel around the island in the blink of an eye. The east coast has one of the densest clusters of international hotels in China. With 47 international premium brand hotels, Sanya is like the “UN” of hotel brands. Gourmet cuisine from many parts of the world can be found, be it Beijing Roast Duck, Sichuan Hotpot, Alaska King Crab, or Thai Mantis Shrimp. But if you want some local food, the four famous dishes of Hainan Island – Wenchang Chicken, Jiaji Duck, Dongshan Goat, and Hele Crab – are a must for the traveling gourmand. Nearly 60 million Chinese tourists travel to Hainan Island each year. In Hainan, Geoffrey and his children will certainly be able to make friends with people from all over China, and learn about the wonderful stories hailing from all over this diverse country. Hainan, a holiday paradise for Chinese and foreign tourists!